Think of DUNDi as a large phone book that allows you to ask peers if they know of an alternative VoIP route to an extension number or PSTN telephone number. For example, assume that you are connected to another set of Asterisk boxes listening for and responding to DUNDi requests, and those boxes are in turn connected to other Asterisk boxes listening for and responding to DUNDi requests. Assume also that your system does not have direct access to request anything from the remote servers. DUNDi performs lookups dynamically, either with a switch => statement in your extensions.conf file or with the use of the DUNDILOOKUP() dialplan function. While DUNDi was originally designed and intended to be used as a peering fabric for the PSTN, it is used most frequently in private networks. If you’re the Asterisk administrator of a large enterprise installation (or even an installation with only a pair of Asterisk boxes at different physical locations), you may wish to simplify the administration of extension numbers. DUNDi is a fantastic tool for this, because it allows you to simply share the extensions that have been configured at each location dynamically, by requesting the extension numbers from the remote location when your local box doesn’t know how to reach them. Additionally, if one of the locations had a cheaper route to a PSTN number you wanted to dial, you could request that route in your DUNDi cloud. 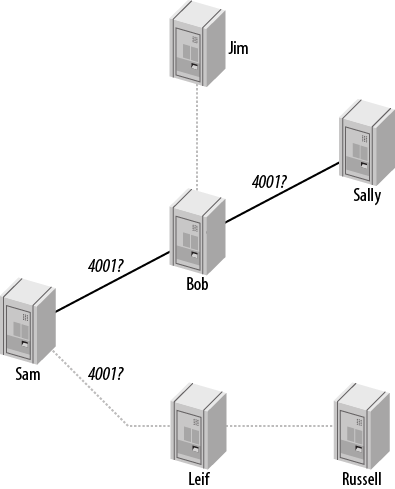 For example, if one box was located in Vancouver and the other in Toronto, the Vancouver office could send calls destined for the Toronto area across the network using VoIP and out the PRI in Toronto, so they can be placed locally on the PSTN. Likewise, the Toronto office could place calls destined for Vancouver out of the PRI at the Vancouver office.